What Has Wheaties – Yes, the Breakfast Cereal – Got to Do with Nuclear Disarmament? William Lambers is the author of Nuclear Weapons, the Road to Peace and Ending World Hunger. His writings have been published by the New York Times, History News Network, The Hill, Newsweek and many other news outlets. 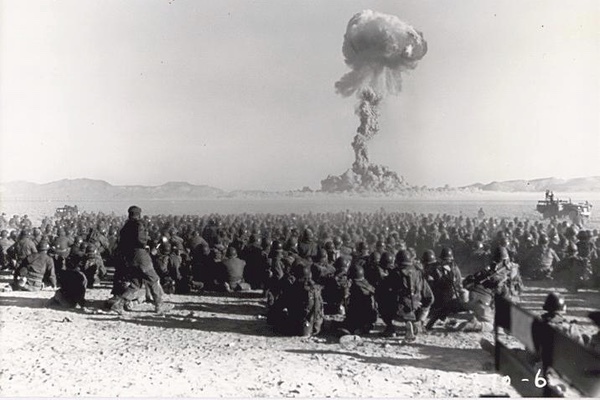 November 1951 nuclear test at the Nevada Test Site, from Operation Buster, with a yield of 21 kilotons. It was the first U.S. nuclear field exercise conducted on land; troops shown are 6 mi (9.7 km) from the blast. The longest journey begins with a single step. One of the first steps toward eliminating nuclear weapons was 65 years ago on December 8 when President Dwight Eisenhower gave his "Atoms for Peace" speech. This history can inspire us today for getting rid of all nukes worldwide. Eisenhower said in his memoirs "to work on the draft of the speech on this subject, Strauss and Jackson met again and again at the Metropolitan Club in Washington for breakfast, appropriately, the project took on the code name Wheaties." Admiral Strauss wrote of the breakfast club, “Our standing order started with a cereal advertised as Wheaties. We began to refer to the enterprise as “Wheaties” when necessary to talk about it on the telephone or elsewhere.” It is the breakfast of champions and nuclear disarmament. Their goal was to alert the American public about the growing threat of nuclear weapons. The Soviet Union had recently tested a hydrogen bomb and the Cold War nuclear arms race was accelerating rapidly. The nukes were vastly more powerful than the weapons of World War II combined. The technology to make nuclear weapons was no longer a secret just for the United States. The Soviets had long had it and many others were likely to as well. Eisenhower wanted the speech to provide hope for escaping this nuclear nightmare. He made last minute edits on the plane ride to New York where he would deliver the speech before the UN General Assembly. There were two major proposals made by Eisenhower in "Atoms for Peace." The first plan was for the Cold War rivals to divert nuclear technology away from military use. Instead atomic energy should be used for peaceful purposes like fighting disease and hunger or providing energy. C.D. Jackson pointed out that the press totally overlooked the second major proposal Eisenhower had made in the speech. The President invited the Soviets and others for negotiations “to seek an acceptable solution to the atomic armaments race.” Arms control and disarmament would not happen overnight, but we must pursue it through diplomacy. These are the critical issues that bind all nations. But as we sit here today there are still 15,000 nuclear weapons globally, most of these held by the United States and Russia. Think of all the precious resources lost in making these nukes that would have been better served in peaceful applications. 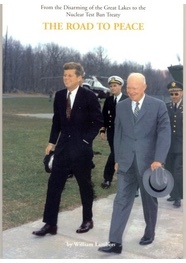 As Eisenhower said we need diplomacy “if the world is to shake off the inertia imposed by fear and is to make positive progress towards peace.” The United States could start by finally ratifying the Comprehensive Nuclear Test Ban Treaty, a goal first pursued by Eisenhower. We should promote disarmament and more peaceful uses of nuclear technology. Every person can make their voice heard on eliminating nuclear weapons. Breakfast anyone?